It’s been an interesting experience to start the year off teaching when my mindset had completely changed. Since February I’ve been preparing myself to be a Technology Coach…not a teacher. Especially not a teacher in an international school. I just finished my first of 2 classes for the day. First day of school, first class I taught at AIS, first class I’ve ever taught made of up entirely 9th graders! They are eager to please but sneaky at the same time and wow are they squirrelly! There were 21 of them in a room half the size of a normal classroom. If you didn’t notice…there is no computer or projector in this room. 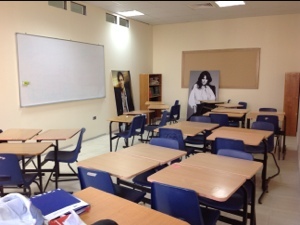 It is a brand new classroom and not entirely ready for classes to be taking place. Very interesting to teach with no technology! I did not tell them that I won’t be there teacher for the entire year, although I briefly mentioned no gum, no food, no cell phones and no online translators. Their new teacher is supposed to arrive late Sunday night so I’m not exactly sure when she’ll be taking over. I may just be teaching through Sunday, I may be teaching 2 full weeks. I’m planning on telling them during our 2nd or 3rd class together that there will be a different teacher. I want to balance between them getting attached and the misbehaving because I’m not staying. We shall see! This afternoon I have my first DP class. I imagine it will be quite the opposite…grade 11 students taking their first French class. The schedule here is really different. I’ll have to share it another time!